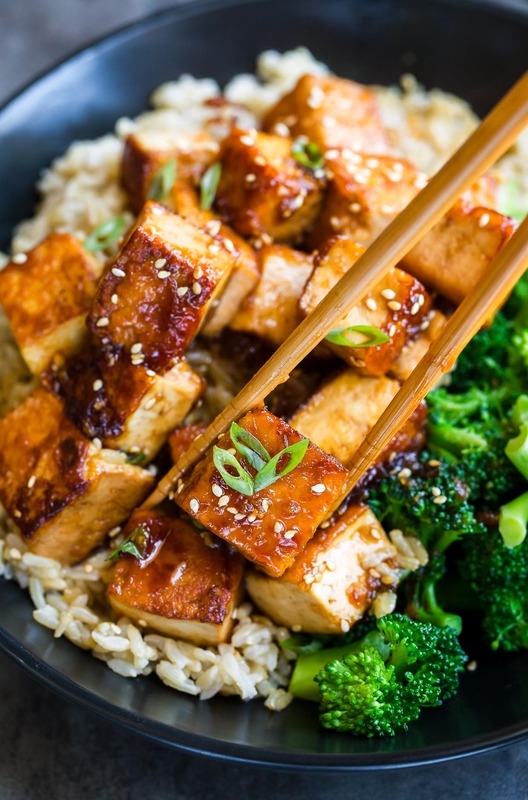 This Honey Garlic Tofu recipe is a great way to jazz up tofu! 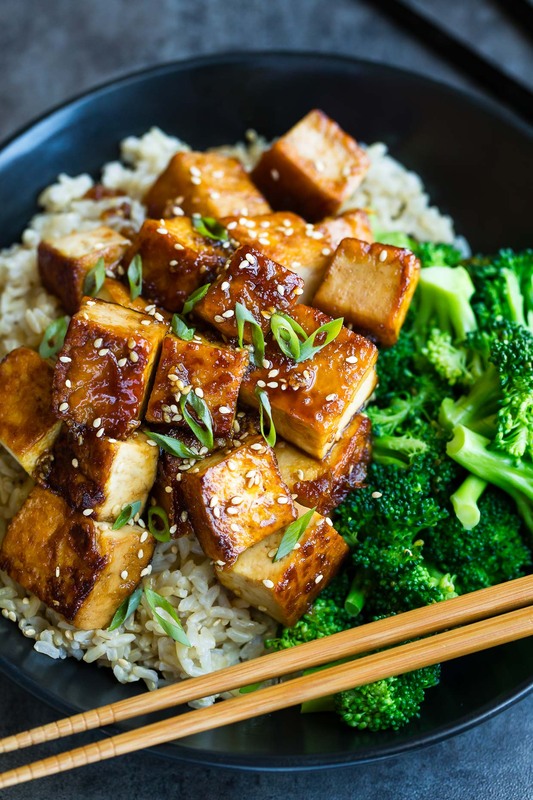 Pair it with crisp broccoli and fluffy brown rice for a tofu bowl that’s sure to have you skipping take-out for this tasty homemade recipe! I’ve been on a serious tofu kick lately! A fun twist on my honey garlic shrimp recipe, this honey garlic tofu is smothered in a sweet and savory sauce and served with veggies and grains for a balanced meal that’s sure to curb your take-out cravings! It’s pretty darn delicious if I do say so myself! Even my T-Rex husband devoured a bowl! Not only is this dish cheaper than take-out restaurant fare, it’s also ready to eat right away, ensuring every bite is piping hot and fresh as can be. No more soggy delivery eats! When it comes to this scrumptious honey garlic tofu, you have two tasty options for cooking your tofu. This is by far the fastest method. You’ll only need about 1-2 TBSP of oil (no deep-frying needed!) and a light dusting of either cornstarch or arrowroot powder will ensure your tofu doesn’t stick and that it gets a nice crispy sear on the edges. The next method requires you carve out 25-30 minutes bake time in your dinner prep schedule but it’s hands-off time you can use to make your veggies and rice so it’s no big deal at all. You’ll bake the lightly coated tofu until crispy on a parchment paper lined pan at about 400 degrees F until the edges are crispy and the tofu is nice and hot. Serve this honey garlic tofu in a bowl piled high with your favorite side dishes. I like to add brown rice and something green. Broccoli, asparagus, edamame, bok choy anything goes! They can be steamed, roasted, or stir-fried. Choose your favorite grains and veggies and make it a meal! 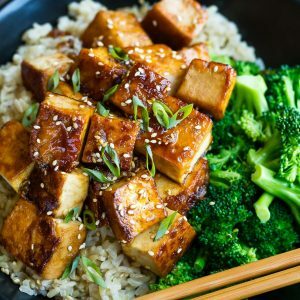 This Honey Garlic Tofu recipe is a great way to jazz up tofu! 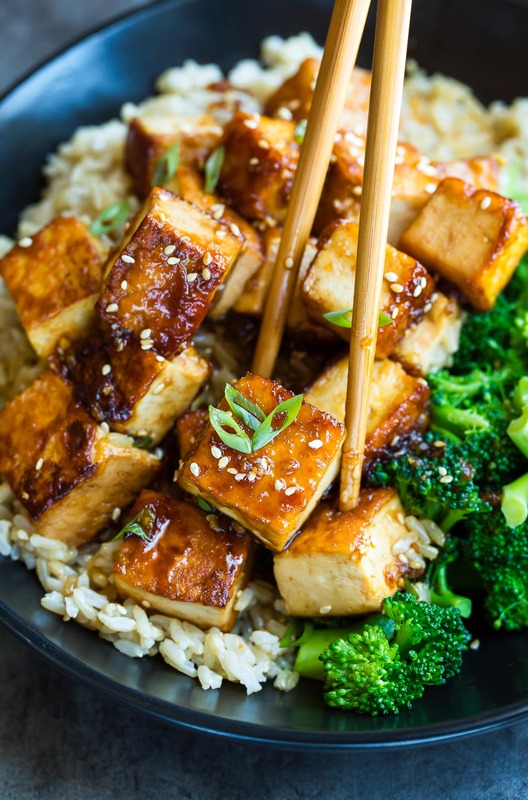 Pair it with crisp broccoli and fluffy brown rice for a tofu bowl that's sure to have you skipping take-out for this tasty homemade recipe! Recipe cook time will vary based on cooking method chosen as baking takes a bit longer than pan-frying. Advance prep: Drain and remove tofu from package. Slice the block of tofu into two 1/2 inch thin planks and place on a stack of 4-5 folded paper towels, placing an additional stack of paper towels on top. Set something heavyish on top (I use a cast iron skillet) to make a make-shift tofu press for water removal. Allow to sit. I usually start my tofu about 30 minutes before I want to start cooking. 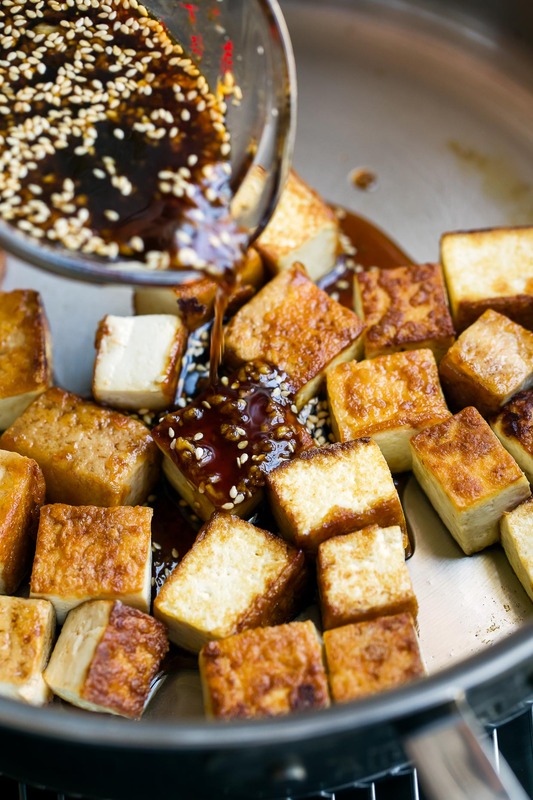 Once your tofu is ready, whisk together marinade and pour over tofu in a small shallow baking dish or plastic bag. Allow to sit in the fridge for 15 minutes while you prep the rest of your ingredients. Alternatively you can marinate your tofu the night before to enjoy the following day. Whisk together honey garlic sauce and add to a saucepan or small pot. Set aside. Once your tofu has marinated a bit, cut each plank into 8 bite-sized cubes, for 16 pieces total. Sprinkle either cornstarch or arrowroot starch over the tofu and gently toss until evenly coated and no powdery spots remain. 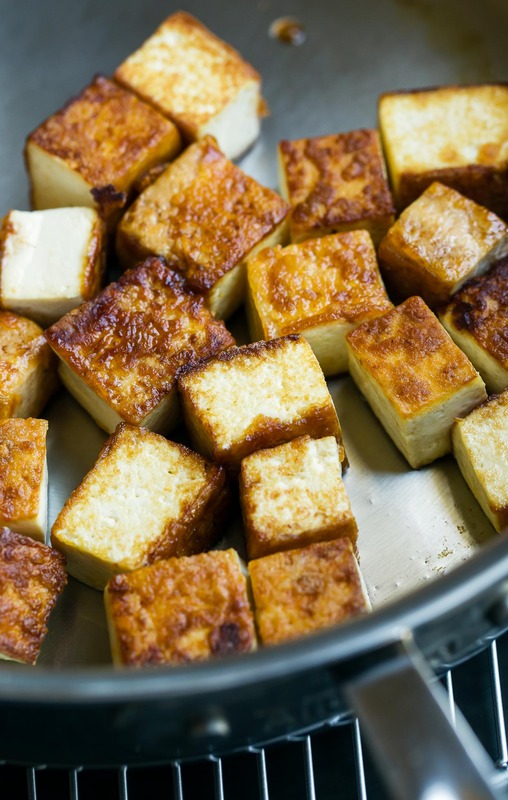 FOR PAN-FRIED TOFU: Bring a pan or cast iron skillet to medium-high heat, then add 2 TBSP oil once hot. Tilt and swirl pan so oil is evenly distributed. Once the oil has evenly heated, add your tofu, spaced, so that no sides touch. Let the first side sear for about 6 minutes so a nice even crust forms. You can shake the pan occasionally so they don't stick but keep them on the first side. Once perfectly golden, flip each tofu nugget to the other side and sear for about 4-5 minutes. Remove from pan and allow to drain on a paper towel. Add honey garlic sauce to the pan over medium heat and simmer the sauce until it starts to reduce, stirring as needed. Once it starts to thicken, remove from heat (it'll thicken a bit more as it cools) and pour over tofu before serving. FOR BAKED TOFU: Pre-heat oven to 400 degrees F and place a piece of parchment paper over a baking sheet. Arrange the coated tofu spaced on the parchment. Bake for 25-30 minutes, tossing or flipping at the 15-minute mark until nice and crispy. Garnish with toasted sesame seeds and sliced green onion. Serve with your choice of grains and veggies and dive in! * I used Low-Sodium Gluten-Free Tamari Soy Sauce for this recipe. 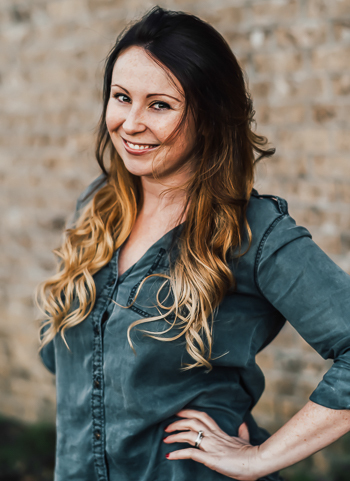 To ensure the type you're using is GF, simply double check the label and you're good to go! If skipping the arrowroot or cornstarch and pan-frying your tofu, you'll want to use a non-stick skillet to prevent sticking. While it's totally optional, I find that marinating the tofu adds so much extra flavor! The tofu ends up crispy on the outside, and creamy on the inside with lots of umami flavor from the soy sauce marinade. Craving a spicy sauce? Add some Sriracha chili sauce or crushed red pepper flakes to the honey garlic sauce. Start with a little and add more to taste. For a vegan swap, feel free to sweeten your sauce with 2-3 TBSP brown sugar in place of the honey. Adjust to taste. I made my rice in the Instant Pot to save on time and keep things hands-off! Add 1 cup of brown rice to your IP along with 1 and 1/4 cups water. Lock lid and set valve to sealed position. Cook on high pressure for 15 minutes, allowing a natural pressure release. One the valve drops, remove the lid and fluff with a fork/spoon. Dive in! If you’re making 2 cups of rice adjust water (or veggie broth) to 2 + 1/2 cups. Cook time will remain the same. Serve with steamed, roasted, or stir-fried veggies and honey garlic tofu. currently behind on . . . Sleep. Always sleep. Super tasty! I used about half the honey and it was just right for us. Had it with quinoa and cabbage. My frying pan sticks like mad so I didn’t get a nice crust on every cube of tofu. Will try baking it next time. I haven’t made this, but wanted to point out, honey isn’t vegan. I know some vegans eat it, but technically, it is an animal product, and not vegan. Calling it vegetarian is more appropriate. I LOVE tofu and love discovering new ways to cook it. This was delicious, but the combination of marinade + sauce made the dish a little too salty for my taste. Next time I will skip the marinade. Thanks! So glad you tried the recipe Vina, thank you! I made this for dinner tonight, this was the first time I have had tofu. The tofu didnt get crispy enough in the oven, may try the pan method next time. The sauce was FANTASTIC! great flavor and the tofu tasted great too ! Glad you enjoyed it Cindy! Totally try the pan method next time if you’d like – it has the crispiest results for sure! I’ve also tried it where I lightly pan fry the tofu and then finish it off in the oven – both methods work great! The honey garlic tofu looks delicious. I’m a meat eater but with all that flavor going on, I don’t think I’d miss the lack of meat. I really like how you got a crust on the tofu. Makes it look extra appetizing. The tofu is so crazy flavorful and filling too! Hope you get a chance to try it Marisa! My daughter loves tofu I am going to make this tomorrow night for her / us. Thanks for the recipe, looks and sounds delicious.